Bristol City Council has produced a new report with some interesting findings about the shift in travel usage. Echoing this week’s report that car use in declining in the UK (while the government is contrarily planning for car use to increase) the Bristol report is being touted as a ‘tipping point’ with how residents are choosing to move around the city. “This is fantastic news for the health of Bristol’s people and prosperity," said Ian Barrett, South West Director for Sustrans. Sustrans added that research from the recent iConnect consortium report showed that people who live near new routes increase the amount of time spent walking and cycling by an average of 45 minutes per week, showing that when quality infrastructure is built, people will use it. According to the report, 44,000 people still commute by car for distances under three miles in Bristol, something that could be done on foot or by bicycle. 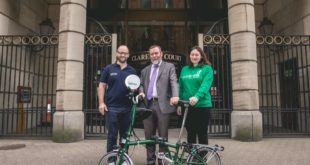 Barrett continued: “Lots more people are enjoying the benefits of cycling to work and we know that many more want to cycle, but are concerned about safety.